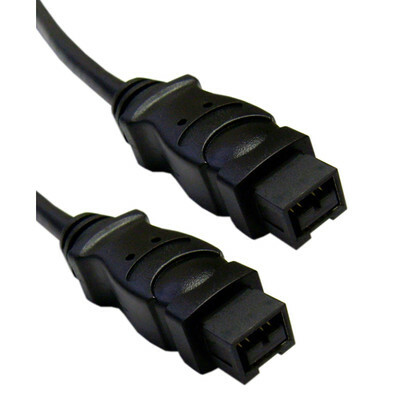 This 6 foot black Firewire 800 (IEEE-1394b) cable features a 9 pin connector on both ends. Our cable features thick cable jacketing with a heavy-duty braided shield for protection from abuse and EMI/RFI. Firewire cables are used to transfer data between Firewire enabled devices such as external hard drives, camcorders, DV recorders, digital cameras, etc to computers, laptops and other Firewire capable devices. When selecting your Firewire cable pay attention to pinning of the devices you are connecting to ensure you choose the correct cable for your application. Our Firewire 800 Cables meet the specifications outlined in the IEEE-1394b standard. This means that one can daisy chain up to 63 supported devices on a single Firewire port provided the devices support daisy chaining. The standard supports the following transfer rates: 3200 Mbit/s (400 megabytes/s) and the older S400 (400 Mbit/s), S200 (200 Mbit/s) and S100 (100 Mbit/s). Lastly the 4 pin connector does not supply power while the 6 pin connector is able to supply power. If your device requires a 4 pin connector it will not be powered/charged via Firewire it will instead use its own separate power.